ArtSavant - interviews - Jeff Moonie, Jr.
produced by Jeff Moonie, Jr.
Jeff Moonie, Jr., winner of the 2005 Asheville Film Festival award for best documentary, talks to Jim Yost about the movie he made with his dad. I was impressed with Donor, and could see why it won top awards in Asheville. How long did it take to make this film? The whole process? I hesitate to answer because, at first, I wasn’t really planning on making the film; I just sort of had the camera running. I wasn’t even thinking about making a film. The whole process took about a year and a half. I also had a lot of [home video] footage from before. But I’d say about a year and a half from filming to editing. You did everything yourself. Editing, producing, shooting? It was never your intention to edit these scenes of your father’s life into a film? I read that your father encouraged you to do it. Is that true? That’s kinda tricky. The reason I even started to run the camera on him is because I wanted to get some archival footage of him dealing with, and overcoming, this disease - for him, for me, and for the family. Once he realized how much trouble it was to get a donor, he thought it would be a great way to educate people on the process of finding a donor, and the after effects that can sometimes happen to the recipient - in this case, graft versus host disease. I thought he was going to get better, so I ran the camera on him. When I saw him begin to change, it fascinated me, and I started to ask a lot of questions. He trusted me, and I just wanted to see where it went and what was gonna happen. When I showed it to him, he didn’t like it, but he told me to go forward and edit the material into a film. Why didn’t he like the film when he first saw it? Most people didn’t see him like he came across in the film. He was a different person, and I don’t think he wanted people to see him like he really was. He had a serious side. He had a creative side. He liked films and filmmaking. And to be honest, we never had a lot of the conversations we had in the movie until I ran the camera on him. He was able to be himself and honest in front of the camera? Do you think the camera was a barrier between father and son? Yeah. In a way, he felt like it was a way to let loose and be honest. I saw him through a lens, and it wasn’t personal. He was just talking to a camera. Susan was another subject of the film. She was a close and personal friend of your father's, who finally lost her battle with cancer. They called themselves the support group of two and seemed to really be connected. Were you as close to Susan as your father was? Yes. I interviewed her a few times, and followed her to the doctor’s office. She was a real sweet lady. As you saw in the film, Susan and her husband came over to our house for dinner when my father was well enough for guests. As you can see in the movie, we all had a great time. Later, I had dinner at her home with her family. Looking back now, I realized it was the first time I had dinner with a white family at their house. She was a great lady. I am still close to her husband. Based on your experiences with this film, having received critical praise, will you make another documentary film? 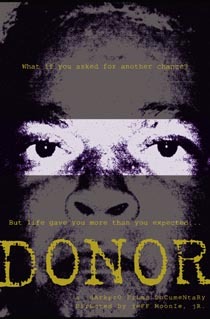 Donor was personal to me. And I really prefer narrative fiction. In narrative fiction, you have control over the characters. With Donor, I was trying to turn real life into a story. It was hard. I didn’t like playing with real people; I had no control over where it went and how it ended. I don’t like dealing with real people and editing their lives together to tell a story. That was one of the hardest parts of making this film. I personally appreciated the way the film was edited and the story. It wasn’t overly sentimental or preachy. And it seems that the critics liked the story. Maybe. To be honest, I never really talked to any critics. When it won at Asheville, I thought it was because people connected to it emotionally. I guess that was the story, ultimately. How easy was it to separate yourself from the subject of the film? You were the son and the filmmaker. It was hard sometimes, but as I said, you look through the camera lens and that makes it a bit easier. Sometimes I had a hard time when I went back to edit. I had to watch my father's biopsy again. When I watched it the first time it was through the camera, and it was like it wasn’t really happening. I wasn’t really looking at something that was reality. When I went back to edit, I noticed for the first time how he looked when he got bad news, or how he had really reacted to something. It was like seeing it for the first time, and that got to me. For me and him, we were trying to get a movie finished. I had to finish this film. For me and him. For us. So, that drove me on, I thought about that as I edited the film together. So, you’re in the film very briefly. And you say some pretty outrageous things. You weren't tempted to edit yourself later? I wanted to be fair. When you run the camera on someone, they aren’t really aware of what they’re saying. They just talk. It happened with my sisters and my mom and my father, and it happened with me. I didn’t edit them, so I thought it would be only fair to keep myself and my comments in the film as they were. It wasn’t flattering. Later, I decided not to be interviewed like the rest of the family. It would’ve been hard to be objective in the interview while I was in the process of making the film. How did the film effect your family? Besides for my father, the film was most cathartic for my mother. She didn’t really get to say what she felt the whole time. When you’re the caretaker, you get taken advantage of sometimes, and nobody stops to ask how you’re doing. So, my mother had the chance to express herself very openly and honestly in the film. She never said any of the things that she says in the film directly to my father. Your mother seems like a very strong woman. A good mother and a good wife. She is. She took a lot on, and did a whole lot by herself. Having lost your father, what is it like to have this film as a record of your father's experience, given the fact that the public is watching it and reacting to it? It’s bittersweet. The fact that he wanted it out there in the world is a great thing. I am pushing to get it out there the way he intended. But it’s our film. It’s ours. I don’t dwell on my father's passing. I keep busy and I try not to think about it. But then, there’s this film. I don’t think I deal with things in the healthiest way. Some people cry, some have a sounding board. I just keep my mind occupied on other things. What’s going to happen with this film next? It will be showing at the Afro-American Cultural Center on April 9th. Other than that, I’m not sure. No plans to enter other festivals? Maybe, yes. Some other national film festivals. I’m on the circuit. Since it’s out there and people are getting something from it, I want to keep sending it out. Is it easy being a filmmaker in Charlotte? No. Not really. I was going to move to LA when I first got out of school, but everybody does that. And you need money to make a film no matter where you are. So I just decided to stay here and try and do it here, with my fathers help. He was very supportive. He wanted me to start here instead of LA. But yeah, people here don’t really think about financing movies. It’s hard. I gotta ask. What three films would you recommend the readers of ArtSavant see if they want to better understand Jeff Moonie, Jr., the filmmaker? Ummm. That’s a good question. The Godfather. Malcolm X and, believe it or not, Sling Blade. I love that movie. Me too. It’s a great film. And The Godfather is a classic. Yep. I love all three of them. Thanks for your time and best of luck with your company DarkPro Films and with Donor.